This handy corner floor rack fits neatly into any corner. 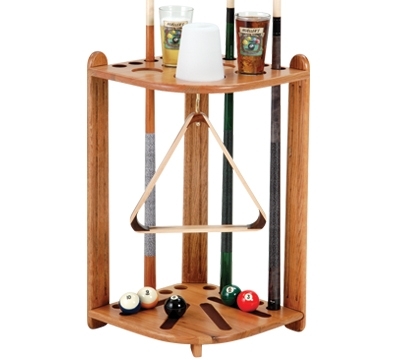 It features four cork coasters for drinks, a cone talc inset in the middle, a hook to hang a triangle, four grooves in the bottom to hold a complete set of pool balls, and holes for up to ten cues. It measures 15"W x 28"H and includes hardware; some assembly required. Call for quantity discounts and dealer pricing.